vehicle design. Explore the process below. THE START OF ANY GREAT CUSTOM BUILD BEGINS WITH CHOOSING YOUR BODY STYLE. E.C.D. AUTOMOTIVE DESIGN HAS VARIOUS MODELS TO CHOOSE FROM IN BOTH TWO-DOOR AND FOUR-DOOR STYLES. EACH STYLE USES GENUINE LAND ROVER DEFENDER PARTS. YOU CAN REST ASSURED THAT WE HAVE THE MODEL YOU WANT FOR THE COMPLETE CUSTOMIZATION JOURNEY. OUR TEAM OF ASE-CERTIFIED MECHANICS ARE HERE TO GIVE YOUR VEHICLE THE POWER YOU DESIRE FROM LS3 ENGINE UPGRADES TO THE CUMMINS DIESEL ENGINE. OUR DESIGN TEAM WILL WALK YOU THROUGH YOUR ENGINE POSSIBILITIES, GIVING YOU A CUSTOM RESTORED BUILD THAT IS MORE THAN A SLEEK FINISH. EACH VEHICLE AT E.C.D. AUTOMOTIVE DESIGN COMES WITH CUSTOMIZABLE SEATS OF YOUR CHOOSING. 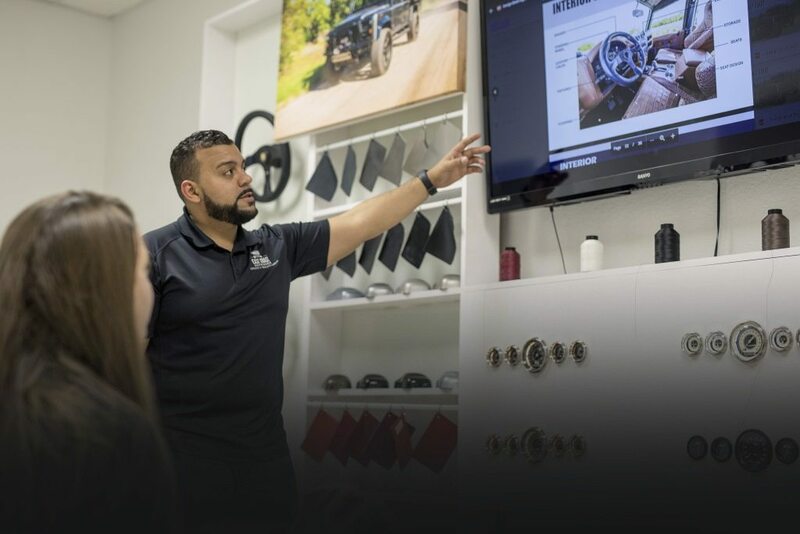 OUR IN-HOUSE DESIGNER WILL GUIDE YOU THROUGH ALL OF THE POSSIBILITIES AT ONE OF OUR DESIGN CENTERS LOCATED IN MALIBU AND ORLANDO. YOU WILL BE PRESENTED WITH VARIOUS SWATCHES AND LAYOUTS FROM STITCHING DESIGN TO FABRIC COLOR TO; CREATE THE ULTIMATE CUSTOM BUILD TAILORED TO YOUR UNIQUE STYLE. NO VEHICLE IS COMPLETE WITHOUT ADDING YOUR UNIQUE TOUCH. OUR DESIGN CENTER LOCATIONS HAVE A HOST OF VARIOUS DESIGN FEATURES THAT CAN GIVE YOUR CUSTOM BUILT VEHICLE THE EXTRA EDGE. OPTIONS RANGE FROM INTERIOR LIGHTING TO KAHN BODY KITS. OUR AVAILABLE FEATURES ARE SURE TO BE A NICE ADDITION TO YOUR ALREADY CUSTOM ECD BUILD.